Henry Parland - The revolution of things, the idealism of things: Immediate as a necktie, the saxophone of life's jazz band! Henry Parland, Ideals Clearance, Trans. by Johannes Göransson, Ugly Duckling Presse, 2006. «The first thing to know about Henry Parland is that you’re excused for never having heard of him. While he is a recurring name in books on Scandinavian literature, his death at 22, in 1930, ensured his eclipse. His work itself is defined by compression and jagged wit, qualities that—at least during the confessional half century following his passing—seem to lend dispatch to an already amputated oeuvre, and the scarcity of translation from the Swedish would appear to have sealed his literary fate. Yet by the time Parland died of scarlet fever, he was an important figure in Finland’s active Swedish-speaking literary scene. He’d published Idealrealisation, an influential book of poems, as well as essays on film (he liked Eisenstein and Charlie Chaplin). His ambitions also ranged to fiction: he’d all but finished a novel about a young man who tries to recapture the essence of his dead lover by writing about her; in an eerily prescient touch, she died of scarlet fever. For all his promise and renown in the late 1920s, by the 1960s his work required rediscovery even on the part of Swedes. Today a cycle of wider reacquaintance seems under way, just in time for the centenary of his birth: besides the first English translation of his poetry collection, titled Ideals Clearance and just out from Ugly Duckling Presse, Parland’s unfinished novel Sönder was translated into French in 2006 and German and Russian in 2007.
to say I’ll be back at 1:10.
and moan slowly in their sleep. paint human features on them. by the heartless wallpaper pattern. and release into the heavens. larger and redder than the rest. "One of the most interesting new poets of 2007 turns out to be Henry Parland, whose first book in English (at least to my knowledge) has just been published by Ugly Duckling Presse of Brooklyn. Parland is one of the great modernists of Swedish literature, in spite of the fact that he did not come from a Swedish family, read & spoke the language for less than a decade, and never once set foot in the country. And in spite of the fact that he died at the age of 22 in 1930. Ideals Clearance, translated ably enough by Johannes Göransson, presents Parland’s first volume, the only one actually published during his lifetime. If Parland doesn’t fit any of the readymade categories into which first generation modernists typically get slotted, part of it may be because Baltic modernism – particularly the poetry – isn’t well known in the west, outside of the Russian Futurists who really are part of a different discussion¹ (tho Parland was born in St. Petersburg & lived there & in Kiev until the age of four when his parents fled the increasingly troubled country for the suburbs of Helsinki). Parland’s outsider status in Finland seemed equally precarious & led to a constant shuffling of schools until, at the age of 14, he was placed in an academy for Swedish Finns, where he was finally introduced to the language at which he would become a master. The other reason that Parland doesn’t fit is that his poetry seems in fact much too contemporary for high modernism. Reading him, one thinks of a later movement, like the Objectivists – think of Oppen’s Discrete Series, Zukofsky’s short poems, much of Rakosi’s work, or Niedecker’s – writers generally Parland’s own age but far removed from the fluid borders of the Baltic whose own literary interventions didn’t get started until Parland had been dead awhile. Or one thinks of certain more recent writers, including the great Finnish-American poet, Anselm Hollo. Parland is somebody whose work wouldn’t seem out of place at Saint Marks, or in the summer program at Naropa, or corresponding with the likes of Joseph Massey, Laura Sims or Graham Foust. Here, for example, is the ninth poem of the sequence, “Socks,” a series that literally engages fashion. what do you know about legs? when you pass the windows of the department store. and a blue murmur across the ground. Anyone who has ever tried to get through a workday with a fever will recognize this slightly hallucinated tableaux, the impossibility of rendering sense from another’s conversation. In the poem from “Stain,” Parland uses the literal fact of his referent, an unintelligible blue smear on the ground, to invoke other equally “unreadable” moments, a lingering dollop of snow, the flash of a smile. I can’t tell how literally sorl translates into murmur, but certainly in English the effect is perfect. Or, more literal yet, “What know you,” which would preserve the power of the single syllable words that are so critical to this poem’s impact in the original. But to do so would lose the sense of ordinary language, and this is a poem that requires the air of the demotic.To quibble that the original puts the ultimate emphasis on legs not century strikes me as missing the point. Within the constraints of translation, and of the original², this is a faithful, workmanlike job. Which means that the attitude, which is what comes across as so distinct, comes not from Göransson but Parland. Parland is not just a good poet – tho he is that – he’s also a particularly instructive poet for somebody like myself. I’m always arguing location, location, location, and that there is no such thing as a poet, only kinds of poets. Yet Parland’s relationship to Sweden is tenuous at best. After school in Finland, he lived what little remained of his life in Lithuania, a nation whose status as such has flickered off & on for centuries. One can only wonder what would have become of Parland had he remained there long enough for the Stalinists to take over. Or if he would have fled west in advance of the Second World War – he was too young for the first. Given the history that was awaiting Parland, there is just no way to speculate as to what he might have become as a writer had he lived. For one thing, he was working on a novel for much of the last two years of his life. So Parland is something of a test case for my idea that poetry is a system and that location is determining as a factor in the questions of what shall be read, when & how. As you can see from descriptions above, I’m mostly forced to compare him to poets whom he almost certainly never read and to some (like Hollo) whom he actually may have influenced.³ Yet perhaps by sitting as outside the system as Parland does, he casts it into an ever sharper relief. By revealing all the ways in which this brief wunderkind doesn’t fit, Henry Parland shows us precisely what “fitting” must mean. ¹ The ways in which Russia both is and isn’t a Baltic state would take a footnote the size of War & Peace to fully tease out. Suffice it to say that Russia has a deeply conflicted relationship to the concept of Europe as well as to its own status as a nation that is both European & Asian at the same time. ² Strumpcentralens is a word that appears just once on the entire web, at least until today, sayeth Google, and that in a PDF version of Parland’s original. «Finland-Swedish poet and cosmopolitan critic, whose career as a writer lasted only a few years - he died at the age of 22. Parland was among the rising stars of modernism in the 1920s, who introduced formalism and semiotic concepts to Finnish literature. IDEALREALISATION (1929) was the only book published during his life time. His brothers Oscar Parland and Ralf Parland also gained fame as novelists. Henry Parland was born in Vyborg into a family with a distant English background. His father Oswald Parland was an engineer and bridge builder, who worked for the Russian civil service. His mother Ida Maria Parland came from a Baltic-German family, the Sesemanns, prominent in Vyborg's history. The family's home language was German and Russian. Parland spent his first years in Russia in Kiev and St. Petersburg. His early diary notes - he was about 10 years old - were written in Russian. In 1912 the family returned to Vyborg and then moved to Finland on the outbreak of the Russian Revolution. When the border was closed, the father was unable to join his family until 1920. Henry Parland's early years in his new surrounding in Helsinki were not happy - he was bullied in a Finnish school. He moved to the Swedish school at Grankulla. According to Oscar Parland he never fully learned the new language, but wrote his books in Swedish. In 1927 Parland graduated from the Grankulla gymnasium, and started to study law at the University of Helsinki. In 1928 Parland made his debut as a writer at the magazine Quosego as the youngest member of the modernist literary group. Parland was in the beginning more interested in fiction, but after meeting Gunnar Björling, the older writer encouraged him to move into poetry. The results were seen in Parland's first collection on poems, IDEALREALISATION, a youthfully cynical visit to the jazz age. It remained Parland's only published book. Parlan's Bohemian lifestyle worried his parents and in 1929 they decided to sent him to Kaunas (Kovno), the capital of Lithuania. There his uncle Wilhelm Seesemann was a professor of philosophy. In a letter to his parents which Parland wrote soon after arriving the city he complained of bad coffee muddy roads. Parland ate daily at the home of his uncle's woman friend. When he was not spending his time in cafés, he worked as a secretary at the Swedish consulate and contributed to Lithuanian magazines. He wrote in German about Scandinavian literature and presented new Russian and American films and Russian avant-garde to the Finland-Swedish public. For his disappointment Kaunas was a periphery of film art - Helsinki was New York compared to Kaunas, as he stated. In 1929 Parland participated in a literary contest arranged by the magazine Bonniers Veckotidningen with the short story 'Jag och min fars glasögon'. It was published in the same year in the anthology De 14 bästä Studentnovellerna. During the winter 1929-30 Parland started to write his first novel, titled SÖNDER, but never finished it. Gunnar Björling read its early draft when Parland visited Helsinki in 1930 and considered it too sentimental and too much autobiographical. The work, which resonates with Proust's Á la recherche du temps perdu and contemporary Russian literature theories, ws partly based on actual events. The protagonist is Henry Rapp, a businessman, who calls himself a writer. He recalls his past and relationship to a woman, Amy. The book ends with the death of Amy, Henry's faithless beloved, who remains a mystery to him. Capturing the atmosphere Baltic jazz age, Parland saw jazz as an expression of revolt against older culture. He was fond of F. Scott Fitzgerald's The Great Gatsby, and wrote in his poem "The dictatorship of jazz - a new form of Catholicism, / I have seen a thousand trouser-creases flutter in rhythmic feeling." In Sönder Parland also referred to another idol: "Motto: this novel is perhaps a plagiarism of Marcel Proust". When 'The Singing Fool' (1928) premiered in Helsinki - it was the first full-length sound film seen in Finland - Parlan greeted with an enthusiastic poem. "“Ich schreibe einen Roman”, he wrote to his brother Ralf in January 1930. This novel was Sönder (om framkallning av Veloxpapper) (To Pieces (on the developing of Velox paper)) and Henry hoped to enter it for a literary prize. He had completed work on the main manuscript by late summer, but was still playing with various alternatives and reworkings when he died. A posthumous collection of his work, published in 1932, included the central body of the Sönder manuscript. The editors were Gunnar Björling, Rabbe Enckell, Sven Grönvall and Henry’s father, Oswald. Björling and Enckell took main charge of the text: correcting spelling, changing names, editing out some passages and bringing the language in line with the conventions of the time. A somewhat modernised and rearranged version was then produced by Oscar Parland, Henry’s brother, in 1966. 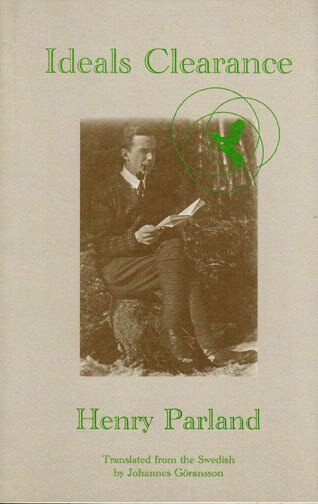 The novel, stripped further of Finlandisms (and of “Parlandisms” arising from Henry’s cosmopolitan linguistic heritage) appeared on its own for the first time in 1987, published by the Swedish Författarförlaget. I became interested in Henry Parland on discovering Podium’s 1998 print-on-demand edition of the 1987 version. After discussion with Oscar Parland’s son, Oliver, I began to translate... Meanwhile the Swedish academic Per Stam – whose doctoral thesis centred on Sönder – was studying the original manuscripts and has now produced a consolidated text, restoring much of the quirkiness of the original. This, with its appendices and commentary, is the basis for my translation. Stam amusedly notes that the novel is “a modernist classic written in invandrarsvenska, or rather invandrarfinlands-svenska”. In the world-weary way of youth, Parland writes of an affair that pretty much ended before it began. (A prefatory Motto announces: “This book is perhaps a plagiarism of Marcel Proust”.) Drawing on the language of photography, Parland evokes the process of writing – and suggests that much of life is in our heads. Proustian moments in 1920s Prohibition Helsinki. Here are the first two chapters of Sönder, based on the working version of the latest edition of the Swedish text, now published as: Sönder (om framkallning av Veloxpapper). Utgiven och kommenterad av Per Stam. (Svenska litteratursällskapet i Finland, Helsingfors/Atlantis, Stockholm, 2005). Before he began writing this novel the writer took his mirror from the washstand, placed it in front of him and inspected his face. It was somewhat elongated, neither out of the ordinary nor without its personal stamp. The eyes were grey and weary, the hair dark, struggling its way back from the forehead to settle, smooth and thick, above the ears. The mouth was a bit bored and heavy, anxious to convey irony – but that required effort. And effort cut two extended streaks at either corner. The chin kept its counsel. Overall the impression was of tentativeness, coupled with a strong sense of self. Sometimes one trait predominated, sometimes the other, depending on his humour, which in turn was dictated by the interplay and harmony between his tie and the invariably semi-starched and long-tipped collar. All this duly corre-lated with a host of external factors such as a ready supply of money, cigarettes, sensual input etc. The writer was none the less in rotten humour on occasions, flawless collar tips notwithstanding. But further probing on this front would take us farther than we might wish to go, so suffice it to say: he was a man of moods. The mirror reflected his image disinterestedly. It had done so several times a day for one-and-a-half years and was now thoroughly sick of the writer’s physiognomy and ties. Mirrors (leaving aside the more phlegmatic pocket variety) are like camera lenses in that they tire incredibly fast of forever seeing the same old face. So that a shaving mirror veritably craves the occasional sight of a pouting female mouth working in its lipstick. And a Zeiss-Ikon lens becomes blurred and out-of-focus when called upon to photograph the same person several times over. The writer’s mirror was no exception. It reflected his jaded and yawning face and, when he continued to stare regardless, grimaced. Knife-like, the streaks at the mouth’s corners clove his features, eye symmetry was lost and the chin gaped contemptuously down. The writer stuck out his tongue at his mirror image, which immediately did likewise; then he lit a cigarette and started to write. He began with a love letter. You died a year ago last week, Ami, and I owe you an apology for failing to mark the occasion until now. Goodness knows why I so completely and utterly forgot; I can’t even remember what I was doing on the day. Probably sitting in the consulate, flicking through stiff, impersonal papers and looking out of the window. It was raining. Although I actually can’t remember too clearly. – Maybe I’m getting mixed up with this time last year. Then it rained all autumn: fine, sharp drops that seeped through clothes, stinging one to a shiver. As we walked home from your funeral, all Sten and I wanted to do was slip in somewhere for a reviving cup of hot coffee. We made for Hotel Kämp on the Esplanade. The café there was so empty that we were in two minds about going in. We sat for two hours talking business. Rolf approached as we were about to leave. Sten told him we’d been to your funeral. Rolf’s spectacles flashed uncomprehendingly. Then something seemed to spring into his mind. “Indeed, indeed”, he said – and proceeded on his way, his carriage a bit too upright. But the last thing I want to do is gossip about your old friends, Ami. Rolf was uncharacteristically vague that day and I’m sure he thought better of his behaviour afterwards. Not to mention the fact that we were standing in the hotel lobby, with people running up and down stairs and doors banging. Distraction enough to bemuse anyone. I’m sure therefore you’ll forgive Rolf and me for failing, each in our own way, to fret enough over your death. My trouble is that I forget things so incredibly fast. Almost faster than you – and you weren’t half good at it. Writing to you as I am now – and there’s a matter I wish to raise with you, almost a business proposition – it is not easy to hit a direct, personal note. I do not see you clearly enough any more. Well, I can maybe just about force my brain to focus in on your every detail, but the image simply doesn’t come to life. Six months back it was another story. But what a difference six months can make! Do you realise you’ve been elevated to the status of some kind of saint? When speaking of you these days it has become obligatory to adopt a dolefully official tone of voice. (Sickening as it admittedly is, I am probably partly to blame.) All these people seem to have forgotten that you were a human being; in their eyes you are but an accretion of fine traits and qualities. I’m sure you don’t much care for that – pretty sure, anyway. Which brings me on to the matter I wish to raise with you – almost a proposal, as I mentioned earlier – and I do hope you’ll oblige. No worries, it’s nothing terrible! I even have an inkling you might like the idea, although I’m having some trouble expressing myself. Hence this long introduction. Look, Ami, I’d like to write this book about you. With your permission of course. I want to write you down as I remember you and I’d very much appreciate your assistance. The manner of that assistance doesn’t matter too much. You’ll doubtless have your limitations: you are dead, after all. Yet you could still potentially help me find a way of not leaving anything out; of getting you properly defined and alive before my eyes. Your cooperation would be much appreciated. Look, I want to have you in front of me again as you were, not as the badly painted icon people have since turned you into. I must smash that icon to pieces, for it is not you. Your job is to assist. I intend to tear your image from every nook of my soul and write it down on narrow-lined, white vellum paper. Maybe it will hurt. There is undeniably a touch of brutality involved. Yet the key, I’m sure, is to prise you free from all the representations you’re tangled up with and which stop me from seeing you there in front of me. You’re afraid you’ll end up dying for me all over again? Darling Ami, in that case just think of those moments of life before you fade out and this book reaches completion. If you are prepared to help me with the writing, that is. And what happens next? Goodness me, we’ve only just begun – and here you are worrying about the end! Anyway, even if you’re not up for it, I’ve at least done the decent thing and notified you of my decision. It’s a pity I had to disturb you in that case, but the damage is now done. I’ll wish you goodnight then, Ami. Think it over. We ought ideally to start tomorrow evening. I’ll be waiting for you around 10. Any earlier probably wouldn’t be a good idea; there’s too much light during the daytime. So, I’ll see you at 10 tomorrow evening. Sleep well. I am the owner of a Zeiss-Ikon camera: 6 x 9 cm plates; aperture: F/6.3. My preferred choice was the F/4.5 model, but it would have cost nearly twice as much and my finances could not stretch to that in one go. The camera has been with me now for three years and I've spent a fortune on plates, accessories and developing. Once upon a time I took landscapes, but now only do individual and group portraits. Landscape photographs are constantly trying to pass themselves off as high art – neither proper nor feasible in my opinion. A photograph should settle for capturing every last detail of a situation and nothing more. Therefore it will always be the snapshot of a moment. Exposure times longer than 1/5th of a second run counter to the very essence of photography. I always do my own developing. Three or four times a year I am gripped by a furious urge to develop and print plates taken several months earlier and left to lie for so long in the cupboard, wrapped in their light-resistant paper, that I cannot even remember what they are. I lock myself into my room, screw a red bulb into the lamp and mercilessly sweep everything off the desk. On it I place baths containing water, developer and acid fixing salts, purchased that same day and dissolved by an ecstatic me in a measuring jug full of hot water. Metol-hydroquinone is my favourite developer. It is handy to use and, given my tendency to get carried away when working on negatives, there is less likelihood of mistakes being made in the heat of the moment. I am also fond of Agfa’s double-sided glass capsules, with their soft tinfoil casing which tears open more readily than a living body, allowing the powder to stream out in white, vitreous grains. Fixing salts, on the other hand, fill me with a certain hostility. Their crystals behave in far too demanding and self-assured a fashion as they plop noisily to the bottom of the glass. I lay the plate in the bath and let the developer glide caressingly over the gelatine membrane, which blushes slightly at the touch of the red lamplight on its pale, matt hue. I sway the bath back and forth and my heart beats ever faster. And when, like a burgeoning flush, the first dark flecks on the plate begin to emerge, the experience reaches its climax. Henceforward I perform with a perfectly cool head as I make the necessary adjustments to shade and intensity. Further mistakes are rare; my hands work with machine-like precision and I experience a weary limpness inside – until the plate in question is sufficiently darkened and the next can be plunged into the bath. Then I surge back to life. Semi-matt, soft paper is my favourite when it comes to printing out negatives, for it offers greater depth and does not distort the image in the way that hard or glossy paper can sometimes do. And whereas developing negatives is a rather theoretical activity – you can only guess at the final result from the density and sharpness of the black swathes – printing renders the miracle real. All at once a face, a landscape, stares out from the pure white sheet, just as you remember, yet clouded by impressions and associations too indistinct to be separated out. Here in the bath, rosily tinged by the red light from the bulb, that blurred and clouded impression reclines intact, sharply differentiated from everything around it, and detailed in a way that only a camera lens – never a human eye – can capture. The whole joy of a photograph lies in those previously unobserved details; once you are used to them and your image of the subject in question is complete, the picture itself is of no further interest. A photograph thus turns out to have a very short lifespan. After just a few hours it appears rather forlorn and bygone and is best put aside and forgotten – until one day, by chance, you are visited by that same sense of immediacy and novelty that comes when small and trivial details make the remembrance of something quite removed and forgotten flash up with all the compelling brightness and suggestive illusion of reality. Never do you get a stronger feeling of this than when you are bent over a developing bath and feature after feature shoots forth, each one complementing – giving new meaning and weight to – the next and finally coalescing as a picture which, wide-eyed, takes in the room like a newborn child. it's on socks it all depends! to the melodies of women's legs. Revolution is a rewarding subject matter to write about. Revolutions have always existed and will always exist. However it is curious that more or less all authors and historians have classified revolutions as a human concern. That non-living entities can "rise up against the existing order" – I have to express myself this way because I can't think of any other way – few of them have ever imagined. In our age the thinking continues to center around humans, only humans humans humans. Like a cat tip-toeing around a hot bowl of porridge, our thoughts focus on the human being; they lick their noses, thinking how good some human soul would taste in their hungry jaws. Is it then so strange that they are blind to the revolution of the things, the things' protest against the ridiculous humanist attitude we first assumed a couple of thousand years ago and in which we've slumbered ever since. For we alone don't have a monopoly on life. Of course we've never had a monopoly and, fortunately, we never will. But just as the Ptolemaic worldview has on Lord knows for what grounds remained intact for thousands of years, the lie of the human being as central to existence has persisted up through these days. Our value is ultimately outside of us, in the life we contain. But things are also part of this context: they live! Their souls (sharply banal?) vibrate to the rhythm of life. The faster the rhythm, the more violent the things' expressions become. They leap up, rush storming toward us: locomotives, car tires, vacuum cleaners. "Life!" howls the spotlight, while the engines whirr our whines into pieces. "Life!" sing the telephone wires, winding along angsty roads. "Life! Life! Life!" But we go on snoring behind the curtains (beautiful curtains!) of aesthetics, humanism, mumbling in our sleep that we've defeated life, happily ignorant of the raging onslaught of the things. Truthfully, anyone who wanders the streets without hearing the posters' clamorous lifesong is both deaf and blind. And anyone who can't see the feminine smiles of the shopping windows is not a man! The things protest against the perception that they exist only for our needs. They demand a position in life – I have learned the following word from the Democrats, so it should be treated with skepticism – Materialism, but not the way we understand the term because that's a misunderstanding. That we are going under in mechanization, superficiality, degeneration? Hell no! We are going under while we're sleeping! While we're trying to use the old, worn-out human measure for everything. While the stars are indifferent to us because they don't want to serve us. While we see only the use of things, not their connection to life. I'm not talking about Americanism. Americanism is a totally different thing, and it has been just as unable to solve the problem as all the other isms. You won't get anywhere by denying all souls, both those of humans and of things. That just makes matters worse. This is about idealism. The idealism of things. The idealism of car tires, stockings, cough drops. They love life, their surface-hymn moves toward deeper connections. Immediate as a necktie – the saxophone of life's jazz band! Henry Parland, To Pieces, Trans. by Dinah Cannell, Norvik Press, 2012. To Pieces is Henry Parland’s (1908-1930) only novel, published posthumously after his death from scarlet fever. Ostensibly the story of an unhappy love affair, the book is an evocative reflection upon the Jazz Age as experienced in the Baltic. Parland was profoundly influenced by Proust’s À la recherche du temps perdu, and reveals his narrative through fragments of memory, drawing on his fascination with photography, cinema, jazz, fashion and advertisements. Parland was the product of a cosmopolitan age: his German-speaking Russian parents left St Petersburg to escape political turmoil, only to become caught up in Finland’s own civil war – Parland first learned Swedish at the age of fourteen. To remove Parland from a bohemian and financially ruinous life in Helsinki, his parents sent him to Kaunas in Lithuania, where he absorbed the theories of the Russian Formalists. To Pieces became the focus of renewed interest following the publication of a definitive critical edition in 2005, and has since been published to great acclaim in German, French and Russian translation. To Pieces is an account of a relationship that Parland is still struggling to come to terms with. Much of it is written in the first person, but in beginning the account, and then for much of the conclusion, Parland steps back, describing his actions as those of 'the writer'. Before he began writing this novel the writer took his mirror from the washstand, placed it in front of him and inspected his face. Instead of immediately beginning the work he wants to write he first writes a love letter -- to the dead Ami -- explaining: "Look, Ami, I'd like to write this book about you." He's an amateur photographer -- serious enough to develop his own pictures (though he only does it three or four times a year, when the urge strikes him) -- and one means of evoking Ami and finding inspiration for his work is to develop an image of her. In addressing her -- and treating her image -- as though she were still able to respond and contribute to his undertaking he brings great immediacy to it; what he can't do, of course, is bring her back to life. Henry remains uncertain about his feelings about Ami. This is not a grand romance of head-over-heels love, and it did not unfold in any particularly neat way. Instead, it describes a human relationship, of two people attracted to one another but not to the exclusion of everything else. Ami, an impetuous girl prone to dropping in unannounced at literally all hours of the night and who likes to get her own way (and often does), has other admirers as well; Henry feels some jealousy but remains reluctant to commit himself in any way fully to her. The tragedy of her death leaves Henry with unresolved feelings that he struggles to deal with here. To Pieces is an appealingly experimental work that holds up remarkably well; there's little here that truly feels dated, despite it having been written around 1930. The motto Parland prefaces his narrative with is: 'This book is perhaps a plagiarism of Marcel Proust', and it is, in part, a Proustian exercise in recalling the past. In his use of advances such as photography, or in addressing the deceased directly, trying to draw her into the book in that way, Parland offers some nice spins on the well-worn genre of reminiscing about lost love. Communications via telephone plays a significant part in the novel -- that's how Henry learns of Ami's passing, too -- and is another filter to experience that Parland uses effectively. People looked at me with guarded admiration, and I had nothing against that, for it helped me hide my hurt at Ami's death, and I am moreover a little susceptible to flattery and admiration. Formally both interesting and creative, and well-written, To Pieces is more than just another unusual-for-the-period piece; a tragedy that its author died at just twenty-two. There's a roughness to the text that can be ascribed in part to his youth, and in part to the fact that the novel is unfinished -- not incomplete (it is whole), but clearly not revised to any final state -- but that hardly detracts from the text.